Commissioned on February 25, 1858, the Harriet Lane was named in honor of President Buchanan's niece and official White House hostess. 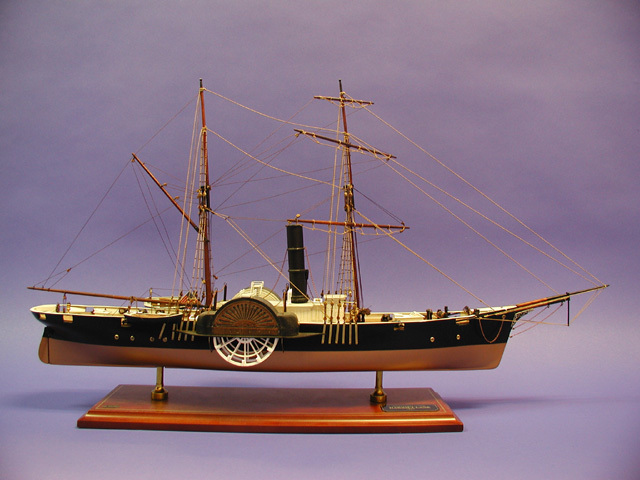 The Harriet Lane was the Revenue Marine's first successful steam side wheeler. She was 180 feet in length, 30 foot beam, 700 tons displacement, and draft of 10 ft. and was armed with one 8-inch rifled gun, 4 32-lbr guns, 2 24-lbr and 1 12-lbr boat howitzers, making her the largest, fastest and most heavily-armed cutter in the service to date. Harriet Lane was probably the best-known cutter in the service during the Civil War. During the shelling of Fort Sumter in April 1861, Harriet Lane patrolled offshore of Charleston harbor, and challenged the steamer Nashville to show her colors. After a shot across her bow, Nashville quickly ran up the Union flag. Captain Faunce noted that his shot "had the desired effect." Thus the Harriet Lane is credited with firing the first shot from any naval vessel in the Civil War. Harriet Lane joined a squadron to capture Forts Clark and Hatteras, which served as bases for Confederate blockade runners. The steamer, with her 8 in. and four 43 lb guns, kept the beach and woods beyond it under fire while soldiers went ashore. This was the first joint amphibious operation of the war, and was a major Federal victory.. The USS Harriet Lane served as Potomac River Flotilla flagship from October 1861 to January 1862, escorting troop and supply ships. She later participated in the capture of Pensacola and the first abortive siege of Vicksburg. Harriet Lane joined the West Gulf Blockade Squadron and On October 1, 1862 entered into Galveston Bay to capture the city. Lane remained with the Federal presence there. On January 1, 1863 a Confederate force attacked Federal garrison and the cutter was captured by boarding. Harriet Lane then gained fame as a blockade runner for the South. Dimensions (L x W x H): 26.5" x 6.0" x 15.5"